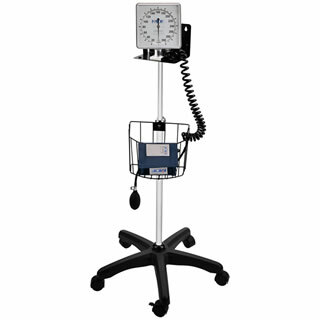 The MDF® Mobile Aneroid Sphygmomanometer incorporates all the features of the MDF® Desk and Wall Aneroid Sphygmomanometer on a quiet, sturdy, easy-to-roll stand. Perfectly suited for vicinities in hospitals, clinics, and nursing homes where repeated blood pressure measurements are conducted. Stress-tested over 3,000 times and calibrated 5 times, it is one of the most durable, accurate, and dependable blood pressure measurement devices on the market. To reduce the parallax effect, the large scale (15 cm) is imprinted with black-bold dials and pressed with a raised outer rim to achieve accurate viewing at all angles. Doubly protected against shock, the internal manometer is enclosed in a die-cast zinc housing that is cushioned within the external high-impact thermoplastic case. The faceplate can swivel smoothly with a wide range of 180° horizontally and 90° vertically to ensure the gauge is easy to see. Abrasion, chemical (chlorine and peroxide), and moisture resistant, the adult Velcro® cuff is constructed of high-molecular polymer nylon. Sized to meet American Heart Association recommendations, the artery indicator label and index range further ensure proper cuffing for correct arterial compression. The 2.4 m coiled tubing and seamless inflation bag are constructed of crack-resistant, non-sticking, high-density hypoallergenic latex-free PVC. The universal bladder tube enables compatible cuff exchange with all MDF® and other major brands of blood pressure systems. Deluxe chrome-plated brass screw-type valve with filter facilitates precise air release rate. The extra-large inflation bulb is constructed of crack-resistant, non-sticking, high-density hypoallergenic latex-free PVC.